Bishop's House and Holy Ascension Orthodox Church, by Robert Spude, 1985. The Church of the Holy Ascension National Historic Landmark is in the village of Unalaska on the island of Unalaska in the Aleutian Archipelago, Alaska. This island is 800 miles southwest of Anchorage, the nearest large city, and is a two-hour flight distant. 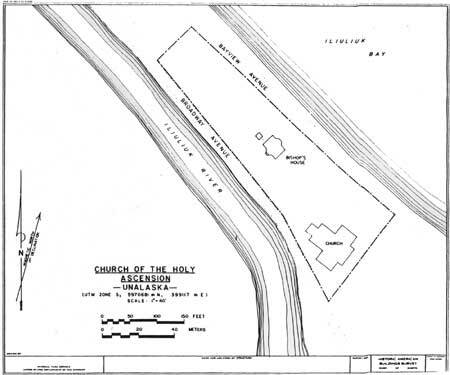 The Historic Landmark consists of the church and a house, both on land designated "The Russian Greek Mission Reserves," which as a whole comprises tracts A, B, and C, or 1.51 acres on the enclosed Plat Map from U. S. Survey No. 853, dated Nov. 12, 1908 (figure 2). The church is on Tract A (0.60 acres), the "Bishop's House" on Tract C (0.59 acres), 457 feet distant, and is noted as the Schoolhouse on the 1908 map. Tract B connects the two and is presently vacant but once contained the U. S. Customs Office, the property being leased from the Orthodox diocese. There is one non-contributing structure on the site, a small furnace house which has been built to serve the Bishop's House. The 800 feet west of the house to the boundary of the site consist of vacant land. Both the church and the house sit somewhat apart from the residential and commercial areas of the community, on a low rise between the bay and the river, the church appearing as a demarcation point between the canneries at the end of the spit and the village to the west (figures 3 and 4). Unalaska is the principal community of the Aleutian chain. Presently it is an administrative and economic center for the burgeoning fish-processing industry of the Bering Sea. The Orthodox parish which bears its name included, at the time the church was built, ten chapels strung along the Aleutian Chain. Today, the parish is somewhat more restricted, but still covers an expanse of more than 1000 miles from Atka (800 miles west of Unalaska) to the Alaska Peninsula. The congregation of the Church of the Holy Ascension is almost entirely Aleut. The Church of the Holy Ascension is designed in the shape of a cruciform, with apse and bell-tower (figures 5 and 6). The facade measures 79 feet, 8-1/2 inches; its depth is 86 feet, 11 inches. Each of the interior functions of the church is expressed in each elevation. The building is wood framed with 8-3/4 inch redwood shiplap siding painted white; it is built on a wooden base with a water line at two feet, 4 inches. The bell tower is the westernmost portion of the building, forming an entry vestibule into the church (figure 7). It extends 13 feet 8 inches from the body of the church and is 14 feet, 6-1/2 inches wide. The tower is approximately 52 feet high and has corner boards. The top of the tower is edged with a cornice which has molded fascia and a plain soffit. The cornice's middle portion is gabled, flanked on either side by horizontal portions Directly below the gabled portion of the cornice is a circle of molding. Two crosses superimposed on a circle are to either side of the large circle. This decorative motif is on the north, south, and west walls, while only the crosses are present on the east wall (figure 8). An octagonal cupola is at the top of this tower. A plain wood collar forms the base of the cupola. The drum is composed of eight eight-paned arched windows through which the cross beams of the tower are visible. 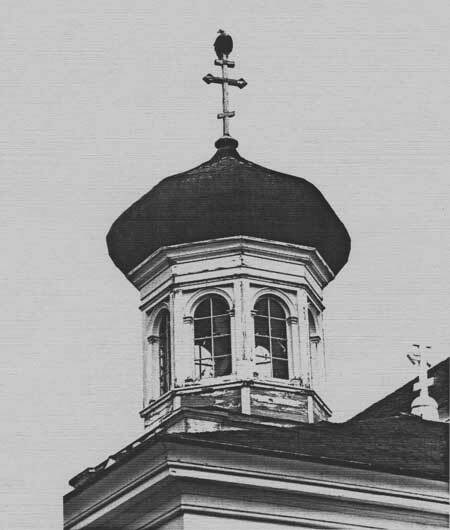 Capping the drum is an onion-shaped dome, topped by a three-bar Orthodox cross. The tower has four-over-four light sash windows on the second-story level on the north, west, and south elevations. The bells are at this site, the windows being opened when they are rung. The windows have molded lintels, plain vertical trim and plain sills. At ground level, the north and south elevations of the tower have a molded panel door with vertical molded trim topped by a plain lintel. On either side of these doors are single-pane windows with molded lintels and plain sills. The south door functions as the main entry to the church. On the ground level of the tower's west elevation is a double molded door with eight panels; it is arched with a plain pilaster and vertical trim capped with a plain pediment. Directly east of the bell tower is the narthex or predvor (before the doors). (figures 9 and 10) This portion is 37 feet 7 inches wide, with the bell-tower centered on its western facade. The narthex has a gabled roof on the west elevation. The south and north elevations are identical containing a six-over-six light double-sash window that has plain vertical trim and sill trim with a molded lintel. The west (gabled) elevation has a single-paned arched window with plain sill and vertical trim and molded lintel flanking each side of the bell-tower. The nave of the church is directly attached to the east of the narthex and measures 37 feet 7 inches wide by 63 feet 4-1/2 inches deep. This central portion of the church is capped by a pyramidal roof. At its peak is an octagonal cupola (figures 11 and 12). The drum of the cupola is composed of eight, eight-paned arched windows placed on a plain octagonal collar. The cupola and the dome, of wood and tarpaper, are the same as those over the bell-tower. The three-bar cross on this dome, however, has a pin on top to discourage birds from perching. The paper on this dome was replaced and painted four to five years ago and is still bright and in good condition. The dome over the tower has not been refurbished in many years due to the difficulty of reaching it. The north and south elevations of the church are identical, having chapels extending from their eastern halves (figures 9 and 13). There is also a six-over-six light double-sash window with plain vertical trim and molded lintels just to the west of the chapel extension and at ground level. These windows have a plain sill with a boxed panel in the area directly below. The west elevation of the nave has only a small exterior exposure above the gabled roof of the narthex. Within these triangular areas, there is a two-over-two light hung-sash window which has a plain sill and vertical trim with a molded arched lintel above. The exposed areas of the east elevation of the nave above the roof of the apse and the chapels are plain. Chapels extend from the nave on both the north and south elevations, 31 feet from the west end of the narthex (figures 13 and 14). Both chapels (St. Innocent on the north and St. Sergius on the south) are identical in elevation and facade. These chapel wings extend 21 feet from the nave and are 32 feet 4-1/2 inches deep. The west elevations are plain with no openings. The north/south elevations of each chapel have, in their eastern half, a six-over-six sash window with plain vertical trim, molded lintel, plain sill and with a molded box panel below. On the western half of the north/south chapel elevations there is a molded panel door with plain vertical trim and topped by an entablature. The east elevations of the chapels each contain two windows of the type described for the north/south elevations. A hip roof tops the chapels peaking at the cornice height of the nave with a small three-bar Orthodox cross. The easternmost portion of the church is the apse which extends 9 feet, 10-1/2 inches from the nave, having the same width as the nave (37 feet, 7 inches). (figures 14, 15, 16) The apse has a hipped roof which peaks at the nave's cornice height. There are two windows on the eastern elevation of the apse and one on both the north and south elevations; they are identical to those described for the chapels. All roofs of the church are wood shingles painted red, with the exception of the two onion domes which are wood covered with tarpaper, which is painted green. The structure's cornices are made up of molded fascia, plain soffits, and molded friezes. The entry door of the Church of the Holy Ascension is on the south side of the bell-tower. The first floor of the bell-tower, as the rest of the interior, is sheathed with tongue-and-groove beaded boards painted white. The molding around the doors and windows in all parts of the church is painted blue. There also is molding with a frieze at the ceilings and a kickboard at the floor; these also are painted blue. The floor, of flush-laid boards, is painted red throughout the church. The semi-circular double six-panelled "front" doors of the bell-tower at the west end of the tower are barred, and are used only for major events such as weddings or the entry of the bishop (figure 17). One panel of the six is missing and has been boarded over. The hinges on the door appear to be original. There are loose floor boards near the south door which is the entry to the church. The door on the north wall is nailed shut. Between the window and door on the north and south walls is a 4 x 4 engaged pier on a low pedestal. There is a glass lantern on a stand to the left of the double-doors leading into the narthex. A brass oil lantern hangs from the ceiling. The narthex contains a coat rack and bulletin board, and has a brass chandelier with candles. Doors on both the south and north walls lead to storage, the one on the north for linens, the south door providing access to a small room used for general storage and with the stairway to the belfry, choir loft and the tower (slide no. 2). The molding trim in this room is also painted blue, although it has not been recently painted. Double-panelled doors lead from the narthex to the nave (figure 18). Immediately to the south of the door and on the west wall of the nave is a semi-enclosed area on a one-foot raised platform. It has a railing and spindled balusters which are painted white with blue trim. This area contains a roll-top desk which is used for storing candles for sale at services. There is a small glass-front cabinet on the west wall within this semi-enclosed space, for display of items for sale. On the south side of the west wall are brackets for holding the heavy rope which raises and lowers the large ornate candelabra hanging from the center of the nave and other brackets for the cords which control the height of the votive candles before the ikonostasis. These ropes disappear through holes in the ceiling and are controlled by pulleys above the ceiling. On the north side of the west wall is a bench. An oil stove, of modern vintage, is also on this side near the back, well away from the walls. There is a hand-rail on the west, north, and south walls, up to the doors leading to the chapels. This, as well as the trim, is painted blue. A strip of blue molding about three-fourths of the way up the wall encircles the nave and on the eastern wall marks the top tier of the ikonostasis. Above the entry to the nave is a semi-circular choir loft, also with a rail and balusters, decorated as the platform below (figure 19). The wooden floor, which is painted red, has a red runner carpet from the narthex to the steps which lead to the ikonostasis and the altar area behind it. The steps and platform (the amvon) are painted in the blue paint of the trim. There is carpeting in the areas on either side of the nave where the people stand, but much of the floor is uncovered. The ceiling is flat, and painted white, except for an area in the middle (figure 20). Here there is a large blue painted circle with a large white star in the center of the circle and smaller white stars surrounding it. From the middle of the center star, the immense candelabra is suspended by means of the rope noted above. Blue molding with a 12 to 18 inch frieze encircles the ceiling. On the north and south walls of the nave are the entrances to the two chapels, the Chapel dedicated to St. Innocent of Irkutsk being on the north (figure 21) and the Chapel of St. Sergius of Radonezh on the south (figure 22). The door to the Chapel of St. Innocent is within the right half of a double arch marked by blue molding; the arches are supported by non-structural square posts, abutting the wall, which are painted white with blue molded trim. The arches are a decorative feature, rather than an opening, although there is some belief in the community that the arches were open at one time. At present, one enters the chapel through a rectangular door hung within the right arch. A glass-front display case is placed within the left arch. It contains a number of treasures dating from the founding of the parish in 1824 and which are believed to have been used by its first priest, Rev. Ioann Veniaminov, now St. Innocent. The entry into the other chapel, dedicated to St. Sergius of Radonezh, is through a rectangular hung door, defined by blue molding. There is no arch on this southern wall. The east wall of the nave is dominated by the focus of the room, which is the ikonostasis (figures 23 and 24). The ikon screen extends across the width of the church and fills approximately three-fourths of the eastern wall, in two tiers. It is approached by way of a three-step platform (the amvon), the steps before the Royal (central) Doors forming a semi-circle into the nave. A wooden railing painted white with gold trim and with spindled balusters encloses the amvon. There are four gates in the railing, the two before the Royal Doors being in the same style as the rail, but the gates leading to the two Deacon's Doors on the left and right being wood panels with decorative cut-outs. All gates swing outward. Within this enclosure, before the ikonostasis, is a lectern on the right for the choir director, 8 brass candlestands and two ikons on stands. The frame of the ikon screen is of wood, painted white with gold trim and decorated on the base with gold crosses within panelled insets and at the top by delicate carved molding. The five ikons on either side of the central (Royal) doors are on linen and are separated by a small semi-circular column with gold trim (figures 25 and 26). They are, from left to right (north to south), St. Alexander Nevski, St. Vladimir, St. Steven (on the Deacon's Door), the Transfiguration of Christ, the Mother of God (Theotokos), the Royal Doors, the Christ Without Hands, the Ascension of the Lord, St. Michael the Archangel (on the Deacon's Door), Saints Cyril and Methodius, and St. Nicholas. The ikons are each within an arched frame. The shape of these arches is reflected in an entrance arch over the central gateway. This arch is of uncertain derivation, as it does not appear in early photographs (See figure 33). The Royal Doors are arched within a rectangular frame and have geometric curved cut-outs around the five ikons of the Evangelists and of the Annunciation; these ikons are round. An historic brass candlestand, in excellent condition, stands before eight of the ikons. Above the Royal Doors is the ikon of the Last Supper in a decorative frame, which takes the shape of a cupola, with a lace-like border carved of wood. The second tier of the ikonostasis consists of an ikon mural on linen which stretches across the entire top of the frame and behind the ikon of the Last Supper. This mural is believed to have been sent to the church by the last tsar of Russia; a photograph taken ca. 1910 shows the east wall without this mural. The top border of this mural is the blue molded trim which surrounds the walls of the nave. Above it are three ikons. An ikon of The Ascension is in the middle; on either side are two larger ikons. All of the ikons on the ikonostasis are badly soiled. At one point in the recent past, the ikons were covered with furniture polish; over time, this has darkened and nearly obscured them entirely. Attempts to clean the ikons on the lower tier with various commercial cleaning agents have been partially successful, but have not been pursued for fear of permanently damaging the paint. The ikons in the upper tiers are too dark to distinguish their subjects. The upper tier of the nave, that is, above the molded trim, has several ornamental features. There are twenty-two decorative doric columns in bas relief, these having no structural purpose, around the north, south, and east walls; they are painted deep red with gold trim, and are decorated with a gold cross and diamond. On the east wall above the ikonostasis, in addition to the ikons noted above, there are four round sun-bursts, made of twisted metal, painted gold. In the center of the two outer sun-bursts is a star, while the two nearest the altar have a cross. On the north and south walls, between the columns are 12 ikons painted on wood with an eight-point star painted gold forming a background and frame. Above each is a free-standing sun-burst halo made of twisted metal painted white. The center "panel" on each of the side walls contains a cross within a torch with a somewhat larger halo above. Within the nave are several ikons of note. On stands on either side of the steps of the central portion of the amvon are two ikons in the Byzantine style, both dated 1821; on the left is an ikon of the Virgin of Kazan (slide no. 5) and on the right is Christ the Saviour. These are especially fine. Affixed to the right side of the altar rail is an ikon of scenes from the life of the Virgin; it is double-framed behind glass and is said to be a miracle-working ikon, with a relic imbedded. It was received at the church between 1907 and 1916, sent from Russia by an anonymous donor. On the south wall is a fine ikon of St. Panteleimon, presented to the church by the St. Panteleimon Brotherhood in 1896; it is covered by a silver riza, and has an antique brass votive candle-holder before it, suspended from a rope through the ceiling. There are numerous ikons on the north, south, and west walls, many of fine quality. A list of the ikons is on file at the church and also in the National Park Service Alaska Area Office. Absent from this list, compiled in 1975, is an ikon, which was not on public display, but is referred to in an article noted in the history section of this report. It is an ikon of the Transfiguration donated to the Church at Unalaska by its first pastor, Metropolitan (now Saint) Innocent in 1870 (slide nos. 9 and 10). It is on the upper back wall of the ikonostasis within the sanctuary. The altar area, or sanctuary, of the church was not open for inspection, due to church regulations, although the room could be photographed from the doorways (figure 27 and slide nos. 7 and 8). The altar is dominated by a cross and a large gold tabernacle (which holds the reserved sacrament) with porcelain and enamel insets; it is encased in a glass covering. Above it is a canopy depicting the descent of the Holy Spirit. The altar room itself is strikingly large and brightly lighted, with four windows, two on the east wall (the rear) and one on each of the north and south walls. In the left corner are both the Table of Oblations containing the vessels used for the Eucharist and the case on which rests the cloth ikon of Christ (plashchinitza) used only on Good Friday. The right (south) side of the sanctuary has a rack for vestments and a cupboard for church records. The chapel to the north is much like the nave, with white walls of tongue-and-groove beaded board and blue molded trim at the ceiling line, around the doors and windows, and for a kickboard. The ceiling is lower than the nave's, and there is no trim three-fourths of the way up the wall. There is a hand railing on the north, south, and west walls; here, it is painted grey. On the south wall, to the west of the doorway are floor-to-ceiling shelves, containing books, many of which appear to be very old. The ikonostasis in this chapel is of special interest (figure 28 and slide no. 11). It is probably original to the first church on the site (1825) and has a number of hand-carved details worked by local Aleut craftsmen. It is of beaded tongue-and-groove boards painted white and bisects the room but does not reach the ceiling. Attached to the top edge is a free-standing carved wooden floral design repeated 4-1/2 times. (figure 29 and slide no. 12). This decoration is painted blue, white and gold. The molding on the perimeters of the ikonostasis and around its doors is painted gold and, according to church documents, is hand-carved. Small gold rosettes carved of wood adorn the top front of the screen above the top tier of ikons. The ikons along the top of the screen are believed to have been on the Royal Doors of the first church at Unalaska. They are attributed to a local Aleut artist, Vasilii Kriukov, and depict the customary Royal Door scenes, being of the four evangelists, Saints Mathew, Mark, Luke, and John, and of the Annunciation and the Virgin. The Royal Doors are latticed with a sunburst of carved wood filling the arch of the frame. The six ikons on the lower tier of the ikonostasis are of relatively modern derivation; they are, from left to right, St. Nicholas, St. Steven (on the Deacon's Door), the Mother of God, the Royal Doors with six small round ikons of the customary subjects, noted above, Christ the Saviour, the Archangel Michael on the right Deacon's Door, and St. Innocent of Irkutsk, in whose name the chapel is dedicated. The ikons on the Deacons' doors were purchased in 1900 by the Church Brotherhood. The ikon of the Last Supper is semi-circular, in a carved wooden frame of the same vintage as the ikonostasis, that is dating from the early 19th century. The frames of the Deacons' Doors, like that of the Royal Doors, are arched, with hand-carved decorative molding. Below the ikons are hand-carved panelled insets framing an ornate cross, and a straight molding trim running the length of the ikonostasis. All of the trim on the ikonostasis is painted gold, except for the topmost rail which is blue. The furnishings of the chapel, in addition to the ikons around the walls, include three ikon stands, two antique candle-stands, a lectern for the choir director and/or reader, a bench along the west wall, and a brass chandelier with candles. There is an old oil stove in the northwest portion of the room, well away from the wall. There is a door to the outside on the north wall of the chapel, but it is nailed shut. There is a window on the north wall, with a light curtain covering, and another window on the south wall, also lightly curtained, which looks onto the amvon, or platform before the ikonostasis in the nave. This window is double-hung sash, with six-over-six lights; it is narrower than the exterior windows, and does not have a lintel. The altar area was not available for inspection, due to church regulations. This chapel, opening from the south side of the nave, is less decorative than the Chapel of St. Innocent of Irkutsk. Its molding is the same as in the nave and the other chapel, and it also has a grey painted wooden handrail around three walls. It also has a door to the outside which is nailed shut, and both a window to the outside on the south wall, and a window into the nave. The ikonostasis here is not ornamented, except by the ikons and a small carved wooden form in a diamond shape above each (figure 30 and slide no. 13). Like the other chapel, it does not reach the ceiling and has a trim of blue molding along the top. Each of the ikons is in a similar gold frame, and all are of a late 19th century, Victorian style. The three door frames of the ikonostasis are rectangular, with blue molding. Each has, however, a semi-circular hung door. The Royal Doors are latticed with the top cut out to form an inverted semi-circle; within this semi-circle is a spikey sun-burst, on a short post. The ikons on the ikonostasis, from left to right are St. Innocent of Irkutsk, St. Steven on the left Deacon's Door, the Holy Protection of the Virgin, the Royal Doors, Christ the Saviour, St. Michael the Archangel on the right Deacon's Door, and St. Sergius of Radonezh, in whose name the chapel is dedicated. The furnishings of the room include three ikon stands, four candlestands in front of ikons on the ikonostasis, a bench along the west wall, and a simple chandelier for candles. The room is heated by an old wood stove in the northwest corner. The altar room was not available for inspection, due to church regulations. The bells are reached by way of a stairway in the storage-room opening from the south wall of the narthex. At the landing above the narthex is a door to the right leading to the choir loft. The bells are to the left across a bridgework constructed over exposed joists and rafters. This "second-floor" space is used for storing seasonal paraphernalia. The bracing beams for the tower are completely exposed here, many of them bolted together (slide no. 15). The cupola here, as well as in the nave, leaks and there is plastic sheeting draped around the beams, and numerous buckets strategically placed to catch the drips. There are seven bells of graduated size. There is a double-hung sash window on the three outside walls of the tower. A wall ladder on the north wall leads to the cupola thirty feet above. The choir loft is infrequently used. It is attached to the west wall of the nave and held by means of two iron rods which protrude through the ceiling of the nave. It is surrounded by a railing with spindled balusters, painted white with blue trim. It contains only a lectern for a choir director. A ladder on the west wall to the north of the loft door, through a trapdoor, leads to the space above the ceiling of the nave and provides access to the cupola above it. The elaborate support system of the roof and the cupola is evident here. The beams cross within the cupola and are clearly visible through the windows in the cupola drum. Where they show, they are painted white (see figure 11). There is no flooring here, only bridge-work over the joists holding the ceiling of the nave, which are at three-to-four-foot intervals. 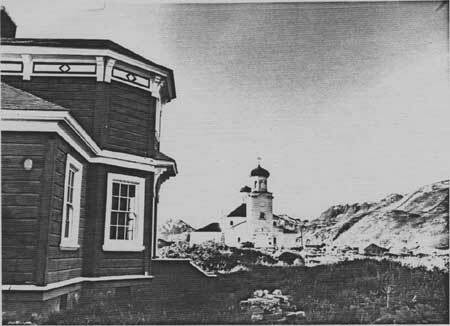 From an undated photograph in the Alaska Historical Library, it appears that the nave at one time did not have windows in its upper west facade above the narthex roof (figure 31). This was changed at an early date, for a photograph ca. 1910 clearly shows the windows (figure 32). There has been very little additional alteration over the years. The main changes entail the removal of various trim items from the bell-tower which consist of: 1) the removal of spires on the top corners at the base of the cupola, 2) the removal of false balconies on the second story window, 3) removal of a belt line above the second-story windows, 4) removal of the lower half of the cornice fascia board, and 5) the removal of the entablatures above the tower's north and south elevation's doors. With these five exceptions, the exterior of the church appears today much as it did at the turn of the century. The interior of the church of the Holy Ascension also has changed very little since its construction in 1894-96. A photograph ca. 1900-1913 shows the ikon wall of the nave without the long mural of the second tier and without the ikon affixed to the altar rail (figure 33). The walls also are plain above the molding strip, lacking the artificial columns, starbursts and the small ikons. The double arches at the entry to the Chapel of St. Innocent suggest that there may at one time have been an opening through both, but there is no documentary evidence of this. Aside from these few items, the interior of the church is essentially the same as when it was built some ninety years ago. The church is well-maintained, the interior being painted every five years, and the exterior every three years. It is clean and light, spacious, and pleasing to the eye, the ikons being of particularly fine quality, several in the Byzantine tradition. The ikonostasis in the Chapel of St. Innocent reflects both elements of folk art as well as local ikonography and is especially noteworthy. The so-called "Bishop's House", located on Tract C of the Russian Greek Mission Reserves, is a 2 x 6 framed structure having six-inch redwood shiplap siding running horizontally, and redwood shingles. Its dimensions are 28 by 32 feet, comprising 1050 square feet (figures 34 and 35). The house has a two-story central section which is 12 feet 10 inches wide by 33 feet 7-1/4 inches deep, and two one-story wings on its east and west sides which are 12 feet 6 inches wide and 23 feet 11 inches deep. The central two-story portion contains a foyer and living room on the first floor and a front study and study/library on the second floor. (See 1881 architectural plans.) Built long and narrow, this portion of the house's south and north elevations are half-hexagonals topped by a gabled roof with half-hexagonal ends. The cornices on the entire structure are molded fascia with plain soffits (figure 36). The second story cornices have ornate friezes with intricately carved wood corbel blocks (figure 37). Friezes on the first floor cornices are plain. The wings of the structure contain a bedroom and anteroom in the west wing and a dining room and kitchen in the east wing. Each of these wings has a half-hip roof, peaking against the second story of the central portion of the house. The east and west elevations of the house are plain, containing no openings (figure 38). On the north elevation the wings each have a six-over-six sash window with plain trim, sill and lintel. The central two-story section of the house has three bays, each forming a plane within one-half of a hexagon, and containing a window on the first and second stories; these windows are similar to those in the wings. All corners of the structure have 1 x 6 vertical molding, and between floors there is 1 x 6 horizontal molding. The south elevations of the wings are the same as those on the north. The south elevation of the central portion, however, differs in that the central bay of the first floor contains the entry to the building (figure 39 and 40). This entry is a molded panel door with a two-light transom with plain vertical trim and lintel. Above this entry is a small portico roof that is supported by two intricately carved wood corbels with a carved circle and cross motif at their bases. On the second floor there are windows in the central and east bay with the west bay blank. The windows throughout the building are of the same type described above. The foundation of the building is constructed of three wythes of brick laid in running bond with flush joints. At various places the brick is laid in an English bond to tie the wythes together. Some time after original construction, a layer of plaster was placed over the foundation to protect the soft brick. In a recent restoration, cement has been poured under the house and a cement coating has been laid over the foundation, with ventilation grills at several points. Originally the interior of this structure was panelled with two-inch beaded tongue-and-groove boards, laid vertically (figure 41). The 12-foot ceilings were panelled in the same way. An eight-inch molding ran horizontally along the walls about 48 inches from the floor. In all rooms, there were 5-1/2 inch moldings at the floor and the ceiling. The carved stairway in the center of the house is of varnished mahogany and is in excellent condition (figures 42 and 43). There were many layers of wallpaper (figure 44), including some Russian newspapers, the remnants of which are still visible on the stripped walls (figure 45). At present the interior is gutted in connection with an on-going restoration project, organized by the Unalaska Aleut Development Corporation. Photographs dating from as early as 1885, five years after construction, show that the house was actually part of a larger complex which included an orphanage/schoolhouse and housing for teachers in the school (figures 46-49). The school was attached to the west wing, which perhaps explains the windowless gable on the second floor. Although used for other purposes from the 1930's on, the complex was intact and essentially unchanged, although in disrepair, until 1960 when a fire destroyed the school house and badly singed the west wall of the house (figures 50 and 51). The house was then boarded up, and has been vacant to the present. In 1976 the first effort at restoration was made when a new redwood shingle roof was added. In 1977 some of the siding was replaced, the floor joists were re-built, some insulation was added, and a sprinkler system was installed. Portions of the sub-flooring were replaced in 1978 along with other minor repair work. Beginning in 1979, the building's exterior was fully restored under the direction of a historic architect, and correction was made in the non-historic work done earlier (figures 52-54). Historic Preservation Funds and a grant from the City of Unalaska financed the project. The money was not sufficient, however, to finish the interior, although insulation, plumbing, and electrical work have been completed. A furnace house with duct work to the main structure also has been constructed in a compatible style. Both the Church of the Holy Ascension and the Bishop's House stand on a low rise between the Illiliuk River and Illiliuk Bay, with roads between them and the bodies of water (figure 55). Hence, there are no structures either north or south of them. The Bishop's House is the closest building to the west of the church and is separated from it by 457 feet which is a vacant field, overgrown with weeds. There are no structures within 800 yards west of the Bishop's House. Thus, it stands somewhat isolated on a low knoll, easily visible from the roads. There are a few houses within a hundred yards of the apse of the church, but they are not on church property, and are clearly separated from it by both a fence and low shrubs. Both buildings because of their present isolation appear somewhat different from the days of their early history. A photograph from the turn of the century (figure 56) shows structures, both commercial and residential, to the east and west of both the church and the Bishop's House, the space between the two being completely occupied, rather than vacant as at present. The present isolation of these two historic buildings, however, enhances their distinction within the village of Unalaska, marking as they do the historic boundaries of the Russian Greek Mission Reserves. Eagle atop Holy Ascension Orthodox Church, by Robert Spude, 1985. The Holy Ascension Orthodox Church at Unalaska and its associated Bishop's House are the most outstanding reflections of a Russian heritage which has permeated the Aleutian Chain from the 1750's to the present. The site was the source of a Russian missionary outreach which was so successful that to this day most Aleuts, who are still a majority of the population of the Aleutian Islands, consider Orthodoxy an integral part of their culture. The site is associated as well with the career of the first resident Orthodox bishop of Alaska, Innocent (also know as Rev. Ioann Veniaminov), who also made lasting contributions to architecture, linguistics, ethnography, historical documentation, public health, and cultural adaptation, and recently has been canonized a saint of the Orthodox Church world-wide. From its beginnings, the church was identified with education and literacy; from the 1890's, the church also was a provider of social services and administration for a vast region. Its influence was wide-spread throughout northern Alaska, and it was a counterpart to the Cathedral in Sitka, which also is a National Historic Landmark. The church itself, built in 1894-1896 in the cruciform style, with three altars, is the oldest church of this type in Alaska. Its utensils, mostly associated with Bishop and Saint Innocent, are especially fine, and its ikons are of rare quality. The ikonostasis of the Chapel of St. Innocent also demonstrates the craftsmanship and artistry of the Aleut people themselves. Unalaska is one of the islands of the Aleutian archipelago. On its northern shore lies the only deep-water port between Yokohama, Japan and Kodiak, Alaska. Only 100 miles to the east is Unimak Pass, the prime deep-water channel, through the treacherous waters of "the Chain." Unalaska's exceptional maritime location, enhanced by the rich marine resources around it, have made it a center among the Aleutian islands since it was first encountered by Russian mariners and fur-traders in the years between 1759-1780.1 Its name (nagun Aliakhekhikh) suggests its importance to the Aleuts themselves, meaning "large island similar in size to the Alaska Peninsula" or "another Alaska".2 By the end of the 18th century, Unalaska Island was a major post for the Russian-American Company, which enjoyed a monopoly in the fur commerce of the region and acted as a quasi-government for the Russian Empire. A permanent Russian settlement had been noted on the island by Captain James Cook in 1778,3 and in 1821, another world traveler, the artist L. Choris painted a watercolor of the village of Iliuliuk (the Aleut name for the village which is now Unalaska) with a wooden octagonal chapel at its western edge. (figure 1). The man who wrote these words was Rev. Ioann Veniaminov. He arrived at Unalaska in 1824 at the age of 27 to be the settlement's first Orthodox priest. Within five years of his arrival, he had developed an Aleut alphabet and founded a school in which he trained others to read both Aleut and Slavonic, the language of the Russian church. He had also built a church, with a belltower and two cupolas, to replace the chapel (figure 2). After ten years at Unalaska, in which he also established Orthodox communities on a number of Aleutian islands and in the Nushagak region of the Alaska mainland, he was transferred to the capital of Russian America, Novo Arkhangelsk (Sitka) to work with the Tlingits, who had been resistant to Christian evangelism. He enjoyed success there as well, also developing a Tlingit alphabet and vocabulary, thereby encouraging literacy, while he also established a native church. His vacination of several chiefs against smallpox, thus saving them and their families, during an epidemic, not only aided his religious mission, but also contributed greatly to public health. Father Ioann in 1840 was consecrated as Innocent, Bishop of Kamchatka, the Kurile and Aleutian Islands, and in 1858 became an archbishop. In 1870 he was named Metropolitan, or head of the church, of Russia, and in 1977, he was canonized by the Orthodox Church as a saint. His career in Alaska included not only the aforementioned linguisitic and cultural achievements, but also architecture, ethnographic studies, and educational policies and institutions. His histories of the Orthodox mission in Alaska are informative and reliable even today.7 He has the distinction of being the only Russian praised by such dissimilar historians of Alaska as the 19th century American Hubert Howe Bancroft8 and the modern Soviet ethnographer Svetlana Federova9 for his ethnographic and linguistic contributions, which are still authoritative. In his first year as bishop at Sitka, he designed St. Michael's Cathedral, which, until it burned in 1966, was a premier example of Russian church architecture in North America and is still a National Historic Landmark in its reconstructed form. The clock which he constructed for the bell-tower was still functioning at the time of the fire. He also built and designed furniture for the Russian Bishop's House (now part of Sitka National Historical Park), which was his residence as well as a theological seminary. While priest at Unalaska and later bishop at Sitka, he founded elementary schools for the education of both Russian and native children. He also founded a Theological Seminary in Sitka in 1841 which trained scores of Alaska natives for a variety of services and occupations, but principally to return as educated leaders and/or priests in their home communities. Many of the students of this seminary went off to San Francisco or St. Petersburg for advanced training and came back for assignment as teachers and priests. The priest Innokenty Shaiashnikov was himself a man of note, distinguished not only for his carpentry, but also as a linguist, teacher, and musician.15 He served as a missionary to the Eskimos of the Yukon region in the mid-1840's before becoming priest at Unalaska in 1848. He also was an Aleut, one of a growing number of native leaders educated by the Russian-American Company and the Orthodox Church in Alaska and placed in positions of responsibility. He served the parish for 35 years, until 1883. The Orthodox Church in Alaska went into a period of decline in the years just before and after the sale of Alaska to the United States in 1867. During the inspection of the Aleutian Diocese in the year 1880, His Eminence Nestor, in person and on the spot, discovered that in some parishes the housing for the clergy was very decrepit and inconvenient, in danger of collapse and that it was impossible [for the clergy] to continue to reside therein; in other localities there was no housing whatsoever, either for the priests or for the songleaders. The situation demanded that either repairs be undertaken or new construction begin. Moreover, he considered the Island of Unalashka the focal point of the diocese from which it was possible to maintain communications with other islands of the Aleutian archipelago as well as with the localities on the mainland, that is, with the Alaska Peninsula, the shore of Bristol Bay and Kuskokwim Bay. His Eminence, [therefore], held it imperative as well as functional to construct at Unalashka a small house for the Archhiaereus [Bishop]. He himself could reside in this house temporarily while touring from time-to-time his far-flung bishopric. In 1880, in the absence of such a facility, His Eminence was forced to take up quarters in the house of the Alaska Commercial Company, sharing them with all the employees and skilled laborers. Out of the 56 days he spent there, there were hardly five when, by ten o'clock in the evening, silence descended following a full day's labors. The reader of the Unalashka church, subsequently consecrated priest, lived at that time in a so-called barabora, an earthen hut with but a single window. His Eminence ordered that a small but suitable house be built for the Reader, at a cost of $600. Considering all this, His Eminence held it necessary to establish on the island of Unalashka a school for preparation of future priests and preachers of the Word of God from among the natives [emphasis in original]. His Eminence proposed to enroll in this school initially at least two boys from each people (tribe  plemia], so that each would be able to converse in his native language and not forget it. It was planned that they be instructed in God's Law and the Russian language, as well as English, and gradually to prepare them to become preachers of the Word of God in the language of their birth. The boys assembled at Unalashka, the central point of the Aleutian archipelago, would remain in a familiar climatic environment, to which they are accustomed in their homeland, and would have the same food and clothing as they use at home. He proposed that the Unalashka school should have a supervisor as well as a teacher, a native who knows Russian and Aleut languages, and has had a proper preparation. He would be under immediate supervision by the local priest. Although the residence, popularly known as the Bishop's House, and the school were built as ordered, the idea of a true pastoral school lay dormant until 1893, and the administrations of Rev. Nicholas Rysev and Rev. Alexander Kedrovsky. Under the direction of the Aleut priest, Rev. Rysev, an orphanage for boys was attached to the primary school and the curriculum enlarged to prepare these young men for service to the church. Reverend Rysev also had successfully petitioned the Holy Synod in St. Petersburg for permission to build a new church, the 1858 structure having also fallen victim to the harsh Aleutian weather. Although the authorization was given, Rev. Rysev was transferred, and the oversight of construction and development of the school fell to a new priest, a graduate of Vologda Theological Seminary in Russia. The right chapel [of St. Sergius] was consecrated on September 4, 1894, the left on January 30, 1895, and on August 18, 1896 the church and all the altar tables were consecrated by His Eminence Nicholas, Bishop of the Aleutians and Alaska. For the main church, ikons on linen for the ikonostasis were purchased, costing $535. In memory of the sacred coronation of the Tsar and Lord of all the Russias, Nicholas II (14 May 1896),... the grateful parishioners of Unalaska parish have expressed a wish to acquire ikons on canvas for the second tier of the ikonostas of the main church in order to include in the number of ikons those which would portray St. Nicholas the Miracle-worker and the Holy Tsaritsa Aleksandra, patron saint of the Tsar and Ruler of All the Russias, now happily enthroned; before these ikons at every service a lamp would be lighted, the oil for which would always be provided by the parishioners. There is attached to the church an ikon, "Transfiguration of Our Lord," on wood, covered by a silver frame (7x6 verskov ),24 sent with the blessings of Metropolitan Innokentii [Veniaminov], with his own inscription [dated] June 27, 1870. The property of the church, according to the inventory compiled in 1896, consists of $18,316.81. In the accounts of the Ecclesiastical Administration of the Holy Synod there is a church sum of $1,185.59 and a chapel account of $907.93, for a total of $2,093.52. The church also has the archbishop's charter on the occasion of the consecration of the first (1824) church, given by Bishop Mikhail of Irkutsk, Nerchinsk and Yakutsk, to Fr. Ioann Veniaminov. On this charter are noted the consecrations of all the subsequent churches. The Unalaska church abounds in every type of property which could be of use to the church. Local tradition at Unalaska, and the style of the ikonostasis itself, suggest that the ikon screen created in 1824 by Aleut craftsmanship is now in the Chapel of St. Innocent. A further indicator is that the chapel is only slightly narrower than the width of the old church (20 feet for the chapel, 24-1/2 feet for the church); hence, the ikonostasis would have fit with only minor trimming. The Church of the Holy Ascension built during 1894-1895, being the third church of that name in the village of Unalaska, is still standing in 1984, having required only normal structural repair of the roof and the belltower and one replacement of the cupolas in ninety years. It was designated a National Historic Landmark in 1971. In the 33 years between the end of Alexander Kedrovsky's administration as priest and dean at Unalaska in 1908, and the Second World War, there were a number of individuals who continued the tradition of Unalaska's dominance, although hard times fell on the village itself as the maritime trade and economy shifted and the Russian Revolution ended financial support for Orthodox churches in North America. The most notable individual in these interim years was Rev. Alexander Panteleev, who was priest at Unalaska for four years between 1909 and 1913. This Russian has left us a charming and informative account of his travels about the parish, reflecting unabashed delight in the Aleutians and the Aleuts.39 He later became Bishop of Alaska, with the new name of Alexei, and returned to spend several years at Unalaska in the late 1930's. He is warmly remembered by older persons in the Unalaska community. One of his legacies is the transcription of a number of Orthodox hymns into Aleut, and the composition of original religious choral music in Aleut. These are still snug in Aleut congregations today. World War II wreaked havoc on the Aleutians, whole villages being evacuated to camps in southeastern Alaska. The chapels at Attu and Atka were totally destroyed during the war, the latter being burned along with the other structures in the village in a scorched earth defense against Japanese invasion. Many of the other chapels were looted and the buildings desecrated. The situation at Unalaska was dire. The natural amenities of the harbor provided the base for an immense military establishment at Dutch Harbor, where at one time 60,000 troops were based, poised for service in the War in the Pacific. In July, 1942, the 111 Aleut villagers were relocated to an abandoned cannery on Etolin Island in Southeast Alaska. With only a few hours' notice, the village managed to remove every sacred item, including the immense chandelier, from the church and put them in safe-keeping. Two different accounts are told of this operation, one party who was present saying the treasures were crated and shipped with the villagers to Southeast Alaska,40 another attesting that everything was buried in trenches on the grounds surrounding the church.41 Virtually every item, however, was preserved, and restored to the church after the war. The story during the years since World War II has been one of survival, rather than of growth. When the people returned to Unalaska, they painted the great old church, repaired its roof, replaced the damaged cupolas entirely, re-hung the ikons, and resumed worship. For a number of years, however, Unalaska did not have a permanent priest. This situation was remedied in 1967, when Father Ishmail Gromoff, a native of St. Paul Island, was assigned to the parish. He is there today. On May 10, 1970, the Church of the Holy Ascension was designated a National Historic Landmark. The parish which Rev. Gromoff now visits by commercial and chartered airlines is much diminished from its height at the turn of the century. After World War II, the villagers of Attu, Kashega, Chernovskii, and Makushin were relocated to Atka and Unalaska and the former villages allowed to disintegrate. There are no longer chapels in these villages nor at Biorka. The ikons in these abandoned chapels were gathered up by the Unalaska priest, Rev. Nagoski, in the 1950's and may today be seen around the walls of the Chapel of St. Sergius in the Unalaska church.44 Besides Unalaska, only Atka, Akutan, and Nikolski (on Umnak Island), of the old parish entities remain. Several communities in the old Belkovsky parish on the Alaska peninsula have now come under the jurisdiction of the Unalaska priest. Rev. Gromoff now calls, on request, at King Cove, False Pass, and Sand Point for religious services. Of these three, only Sand Point has a reader to sustain religious observances in the priest's absence, and all three communities meet in private homes, rather than in a chapel. In all, there are today some 450-475 persons in the far-flung Unalaska parish. Whether they meet in a home or chapel, or attend services infrequently, the Aleuts of the Chain still look to the Church of the Holy Ascension as their cathedral and consider it an especially significant part of their heritage, as Orthodoxy itself is deemed an inextricable part of what it means today to be Aleut.45 Today, however the Aleuts living in Unalaska are a minority of the population of 1400,46 and the number of parishioners available to keep up the church is small and elderly.47 There are now two other religious congregations on the island which compete for loyalty. The commitment to the Church of the Holy Ascension is intense, however, and the church is regularly painted both inside and out by the parishioners, and its grounds are well-maintained. Costs of heavy maintenance, such as foundation, roof and cupola repair are, however, beyond the means of this population. Historic Preservation Funds in 1978-79 accomplished roof repair and some work on the cupola over the nave, but the ravages of weather are unceasing. Nonetheless, the Church of the Holy Ascension, now among the oldest churches in Alaska,48 and the oldest of the cruciform style, is a living institution, and a visual reminder of the important role of both Russian contact and the Orthodox religion, not only among the Aleuts, but in North America as well. 1Svetlana G. Federova, The Russian Population in Alaska and CaliforniaLate 18th Century-1867, trans. and ad. by Richard A. Pierce and Alton S. Donnelly, Materials for the Study of Alaska History, No. 4 (Kingston, Ontario: Limestone Press, 1973), 110-114. 2Alexander Kedrovsky, "Istoriko-statisticheskoe opisanie Unalashkinskago Voznesenskago prikhoda [Historico-statistical Description of the Unalaska Holy Ascension Parish]," Amerikanskii pravoslavnyi vestnik ["Russian Orthodox American Messenger"], I (June 13-27, 1897), 418. This article is the first of a four-part series in Numbers 20-23 of volume I (1896/1897). The pages are sequential throughout the volume. This journal will be cited hereafter as, ROAM, with page number(s). 4Lydia T. Black, "The Church of Father Ioann" (unpublished manuscript, 1978), 1-3. This manuscript is the most complete history available on the early churches at Unalaska, containing several translations from Russian church documents. 5Kedrovsky, "Historico-statistical Description," ROAM, I, 440. 6Robert Nichols and Robert Croskey, eds., trans., "The Condition of the Orthodox Church in Russian America: Innokentil Veniaminov's History of the Russian Church in Alaska," Pacific Northwest Quarterly, 43 (April 1972), 42. 7Ibid., 41. The editors describe Veniaminov's history as "a basic source for the early history of the Russian Orthodox church in Alaska." 8Hubert Howe Bancroft, History of Alaska, 1730-1885 (Darien, Conn.: Hafner Publishing Co., 1970; originally published 1886), 701, fn. 6, comments, "In his Letters [sic] Concerning the Islands of the Unalaska District..., Veniaminof shows that he had become thoroughly acquainted with the Aleuts, their language, customs, and history, and his work is the most reliable book on the subject." 9Federova, The Russian Population, 19: "Veniaminov's work is a thorough and serious investigation, containing priceless material on the history, ethnography, linguistics, minerology, flora and fauna of the Aleutian Islands.. "
10Black "The Church of Father Ioann," 6-7. 11Ioann Veniaminov, Zapiski ob ostrovakh Unalashkinskogo otdela [Notes on the Islands of the Unalaska District], (3 vols. in 2; St. Petersburg: The Russian American Company, 1840), I, 174; cited in Lydia Black, "The Curious Case of the Unalaska Icons," Alaska Journal, 12 (Spring 1982), 10. 12Black, "The Curious Case of the Unalaska Icons," 10. 13Church of the Holy Protection, Mikhailovskii Redoubt (St. Michael), Archives of the Alaska Diocese, Kodiak Alaska, microfilm No. 9; see Barbara S. Smith, Russian Orthodoxy in Alaska: A History, Inventory, and Analysis of the Church Archives in Alaska with an annotated bibliography (Anchorage, Alaska: Alaska Historical Commission, 1980), 88, for listing of contents of the records of Rev. Gregory Golovin. 14Holy Ascension Orthodox Church, "Vedomost' o tserkvi... 1879 [Register of the Church...1879]," Alaska Church Collection, Library of Congress, Washington, D. C., cited in Black, "The Church of Father Ioann," 9; hereafter, "Shaiashnikov 'Register'," in Black, "Church of Father Ioann." 15Barbara S. Smith, "Cathedral on the Yukon," Alaska Journal 12 (Spring, 1982), 52-53. 17"Measures Undertaken by His Eminence Nestor, Subsequent to the Diocesan Inspection," trans. by Lydia T. Black from undated clipping in Archives, Alaska Diocese, Kodiak, Alaska. It is from a Russian periodical, probably the official journal of the Russian Holy Synod, Tserkovnyi pravoslavnyi vestnik [Orthodox Church Messenger], 3-14. From internal evidence, the date of publication would be 1881 or 1882, as this is a report of actions by the Holy Synod. 19Ray Hudson, in interview with author, Anchorage, Alaska, August 18, 1984. 20Kedrovsky, "Historico-statistical Description," ROAM, I, 442. 21"Puteshestvie Ego Preosviashchestva Preosviashchenneishago Nikolaia, Episkopa Aleutskago i Aliaskinskago, po Aliaske [Travels of His Eminence Nicholas, Bishop of the Aleutians and Alaska, Around Alaska]," ROAM, I (August 1-13, 1897), 485. 22Murray Morgan, Bridge to Russia, Those Amazing Aleutians (N. Y.: E. P. Dutton & Co, 1947), 130-132, cited in CNL Designs, "The Bishop's House, Unalaska: A Preservation Project" (unpublished report; Anchorage, Alaska, 1979). 23Kedrovsky, "Historico-statistical Description," ROAM, I, 466. 24vershok (pl. verskov) equals 1-3/4 inches. 25Kedrovsky, "Historico-statistical Description," ROAM, I, 441-442. The accounts from the Kedrovsky years use the formula phrase "v meste i na meste [in place of and on the site of]" without the precision of either Veniaminov or Shaiashnikov, who clearly indicate the location of the new construction to the old. The confusion arises because this stock phrase is used in describing the location of the Shaiashnikov church in the historical section of the registers of the 1890s, whereas Shaiashnikov himself in his own account of 1879 (see note 14 above) clearly states that his new church was slightly to the south of the former. Hence, the phrase in the later registers is unreliable. 29 "Shaiashnikov Register," in Black, "The Church of Father Ioann," 10. 30"Unalaska Church Register," 1894, 22 and verso. 31Kedrovsky, "Historico-statistical Description," ROAM, I, 439. 32Kedrovsky, "Historico-statistical Description," ROAM, I, 466. 33Kedrovsky, "Historico-statistical Description," ROAM, I, 495. 34"Travels of [Bishop]... Nicholas...Around Alaska," ROAM, I, 485. There are many references in ROAM to Amkan, through 1917. 35Daniil Yachmenev, "Of Blessed Memory" (re: Fr. Apollinary Kedrovsky), ROAM, 19 (1916), 474, describes his experience at the Veniaminov School eight years after leaving Unalaska. 36Bishop Innokentil (Pustynskii), "Otchet o sostoianii Aliaskinskago vikariatstva za 1906 god [Report on the Condition of the Alaska Vicariate for 1906], ROAM, 11 (May 1-14, 1907), 169. 37Personal observation by the author. A plaque on the ikon so states. 38Alexander Kedrovsky, "Piatiletie tserkovno-prikhodskago Bratsva na ostrove Unalashke (1898 g. - 6 Dekabria - 1903 g. [Five Years of the Church-parish Brotherhood on the Island of Unalaska (December 6, 1898 - 1903)]", ROAM, 8 (April 1-14, 1904), 137-140. 39Panteleev, Alexander, "Pokhodi po Aleutskim ostrovam [Journeys Among the Aleutian Islands], ROAM, 14 (1910), 270-272, 286-288, 304-306, 317-319; 15 (1911) 56-59, 77-78, 95-96, 170-171, 336-339; 16 (1912), 372. 40Personal interview with Walter Dyakanoff (Unalaska, July 21, 1984), village elder and church starost' (caretaker, sexton) for many years. 41Personal interview with Philemon Tutiakoff (Unalaska, July 22, 1984), village elder and presently church reader. 42Personal interview with Ray Hudson, August 18, 1984 in Anchorage, Alaska. Mr. Hudson is a teacher in the public schools of Unalaska, and an authority on Unalaska history. 43CNL Designs, "The Bishop's House, Unalaska." An excellent history of the Bishop's House and its importance to the Aleut community is contained in a background report done by Carrie Reed for the architectural firm, CNL Designs, of Anchorage, Alaska. Copies of this report are available from the Unalaska Aleut Development Corporation, Unalaska, Alaska or from the Office of History and Archeology of the State of Alaska, Division of Parks, Anchorage, Alaska. 44Personal interview with Ray Hudson, August 18, 1984, in Anchorage, Alaska. 450n this point, see Richard Dauenhauer, "The Spiritual Epiphany of Aleut" (unpublished manuscript; Anchorage, Alaska: Alaska Native Foundation, Center for Equality of Opportunity in Schooling, 1978), as well as CNL Designs, "The Bishop's House, Unalaska," section on "Community Profile and Historic Resources Inventory." 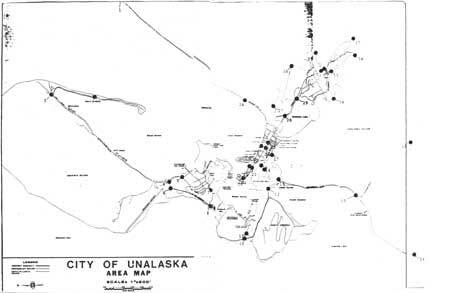 46City of Unalaska, Planning Department, Draft, 4. 47According to Rev. Ishmail Gromoff, the present number of people on the church rolls is 175-200. In a personal interview, Walter Dyakanoff told the author (July 21, 1984) that, as caretaker, he finds it hard to find enough parishioners willing to work on the church. 48The oldest standing Orthodox church is at Belkovsky on the Alaska Peninsula. It was built in 1881, but has been out of use for many years. Both the church at Juneau (1894) and Kenai (1895) are roughly contemporaneous with the Unalaska Church of the Holy Ascension, and all three have active congregations. The Unalaska church, however, is of a scale and richness far exceeding the smaller churches. Black, Lydia T. "The Curious Case of the Unalaska Icons," Alaska Journal, 12 (Spring 1982), 7-11. Federova, Svetlana G. The Russian Population in Alaska and CaliforniaLate 18th Century-1867. Translated and edited by Richard A. Pierce and Alton Donnelly. Materials for the Study of Alaska History, No. 4. Kingston, Ontario: Limestone Press, 1973. Nichols, Robert, and Croskey, Robert, editors and translators. "The Condition of the Orthodox Church in Russian America: Innokentil Veniaminov's History of the Russian Church in Alaska," Pacific Northwest Quarterly, 43 (1972), 41-54. Smith, Barbara S. "Cathedral on the Yukon," Alaska Journal, XII (1982), 4-6, 50-55. ______. Russian Orthodoxy in Alaska: A History, Inventory, and Analysis of the Church Archives in Alaska, with an annotated bibliography. Anchorage, Alaska: Alaska Historical Commission, 1980. Innokenty (Pustynsky), Bishop. "Otchet o sostolanii Aliaskinskago vikariatstva za 1906 god [Report on the Condition of the Alaska Vicariate for 1906]." Amerikanskii pravoslavnyi vestnik [Russian Orthodox American Messenger], XI (May 1-14, 1907), 156-169. Kedrovsky, Alexander. "Istoriko-statisticheskoe opisanie Unalashkinskago Voznesenskago prikhoda [Historico-statistical Description of the Unalaska Holy Ascension Parish]," Amerikanskii pravoslavnyi vestnik [Russian Orthodox American Messenger], I, No 20, 418-420; No. 21, 439-442; No. 22, 465-467; No. 23, 494-496. ______. "Piatiletle tserkovno-prikhodskago Bratsva na ostrove Unalashke (1898 g. - Dekabria - 1903 g. [Five Years of the Church-Parish Brotherhood on the Island of Unalaska (December 6, 1898 - 1903)," Amerikanskii pravoslavnyi vestnik [Russian Orthodox American Messenger], VIII (April 1-14, 1904), 137-140. "Measures Undertaken by His Eminence Nestor, Subsequent to the Diocesan Inspection." Translated by Lydia T. Black. Tserkovnyi pravoslavnyi vestnik [Orthodox Church Messenger], n.d. [1881 or 1882], 3-14. Panteleev, Alexander. "Pokhodi po Aleutskim ostrovam [Journeys Among the Aleutian Islands]" Amerikanskii Pravoslavnyi vestnik [Russian Orthodox American Messenger], 14 (1910), 270-272, 286-288, 304-306, 317-319; 15 (1911), 56-59, 77-78, 95-96, 170-171, 336-339; 16 (1912), 372. "Puteshestvie Ego Preosviashchestva Preosviashchenneishago Nikolaia, Episkopa Aleutskago i Aliaskinskago, po Aliaske [Travels of His Eminence Nicholas, Bishop of the Aleutians and Alaska, Around Alaska]," Amerikanskii pravoslavnyi vestnik [Russian Orthodox American Messenger], I August 1-13, 1897, 484-485. Black, Lydia T. "The Church of Father Ioann". Unpublished manuscript, 1978. CNL Designs, "The Bishop's House, Unalaska: A Preservation Project." Unpublished report. Anchorage, Alaska, 1979. Available through Unalaska Aleut Development Corporation or State of Alaska, Division of Parks, Dept. of History and Archeology, Anchorage, Alaska. Dauenhauer, Richard. "The Spiritual Epiphany of Aleut." Unpublished manuscript. Anchorage, Alaska: Alaska Native Foundation, Center for Equality of Opportunity in Schooling, 1978. Unalaska, City of. Planning Department Draft, n.d.
Washington, D. C. Library of Congress. Manuscripts Division. Alaska Church Collection. Vedomost' o tserkvi... 1894, 1895, 1899 [Registers of the Holy Ascension Orthodox Church for 1894, 1895, 1899]. Box D95. Dyakanoff, Walter. Unalaska, Alaska. Interview with author, July 21, 1984. Gromoff, Rev. Ishmail. Unalaska, Alaska. Interviews with author, July 21-25, September 17, 1984. Hudson, Ray. Unalaska, Alaska. Interview with author in Anchorage, Alaska, August 18, 1984. Tutiakoff, Philemon. Unalaska, Alaska. Interview with author, July 22, 24, 1984. 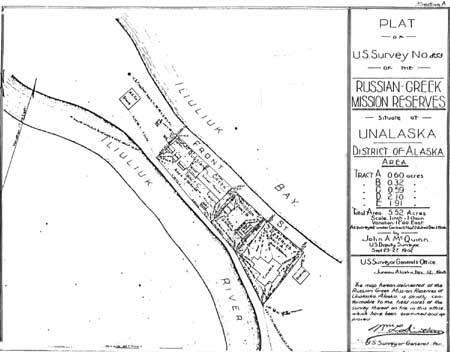 The Holy Ascension Orthodox Church National Historic Landmark, at Unalaska, Alaska, is on Tracts A, B, and C of the Russian Greek Mission Reserves, persuant to Act of Congress, June 6, 1900, and recorded on U. S. Survey No. 853, Nov. 12, 1908. Beginning...The boundaries of the Holy Ascension Orthodox Church National Historic Landmark conform to the historic plat being tracts A, B, and C of the Russian Greek Mission Reserves. The Church is on tract A, the Bishop's House on tract C; tract B, a vacant lot, connects the two structures. There is one non-contributing structures on the site, a small furnace house to serve the Bishop's House, which is constructed in a like style and does not impair the integrity of the property. 10.a. The boundaries of the Holy Assumption Orthodox Church National Historic Landmark conform to the historic plat contained in the U. S. Land Survey of 1908. Within the site, there is a modern log structure, which houses the Kenai Museum; it contains pertinent exhibits but is not a historic building. There also is a temporary structure used for storage near the rectory, but it does not have a permanent detrimental effect. These two non-contributing structures do not impair the integrity of the site.